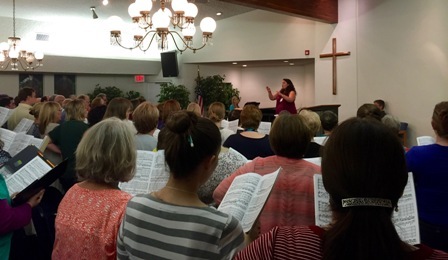 Bakersfield Master Chorale’s Young Artist Development Program participants Karissa Lystrup – accompanist, Melissa Nixon – conductor, and Elizabeth Provencio – conductor, put the Chorale through their paces on Tuesday night rehearsing the Requiem of W.A. Mozart, while exploring romantic and historically-informed approaches to the work. All three of these outstanding young artists did a wonderful job maneuvering the intricate passages with grace and confidence. 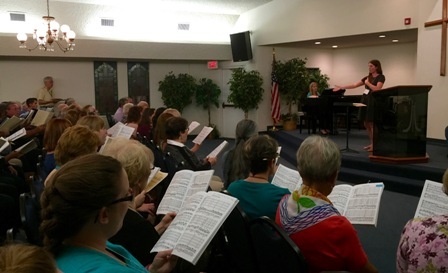 The Chorale will be the guest artist of the Bakersfield Symphony Orchestra at their next concert, November 14th, performing Mozart’s Requiem. For more information and tickets, visit bsonow.org. 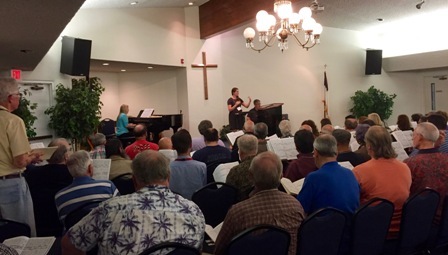 And here we see Young Artist Development participant Tori Carrillo warming up the Bakersfield Master Chorale at the most recent rehearsal.